Artichoke Vegetable Seed delivered direct by D.T.Brown seeds. Artichokes are believed to of originated from somewhere in the Mediterranean, although some historians have said they originated from northern Africa. Artichokes are one of the oldest cultivated vegetables and will crop for around 4-5 years. This perennial vegetable is a real treat and is ornamental enough for the back of a flower border. 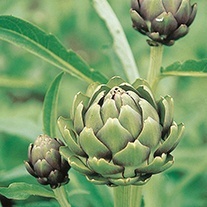 Surprisingly easy to grow and manage, growing artichokes from seed can save you a small fortune to supermarket prices. Do find space for this elegant, delicious vegetable.